Cook your couscous according to the instructions on the packet. In the meantime, chop up all your veggies, put them in a large bowl, and pop them in the fridge. When your couscous is done cooking, let it cool for 15 minutes then put it in the bowl where your veggies are. Add the juice of 2 lemons. Gently toss the salad with a spatula. Pop back in the fridge to chill for a couple hours before serving. Hot weather is definitely not “cool party” weather! Let’s talk about how ridiculously hot the entire United States has been the past month. We can’t catch a break, can we? I mean, I know it’s summer but I’m sweating just thinking about the temperature outside right now! Walking across the street to get the mail seems like a chore. Mother Nature is relentless! Just the thought of stepping outside for a hot second (literally), is making me want to eat something ice cold. COLD food is the cure for me on hot summer days. Israeli cous-cous pasta salad! It’s got the benefits of a salad and the presentation is simple and elegant with the pearl-like pasta shape! The best part of it is that it’s served cold, straight out of the fridge. It seriously gives you the cool down you need when coming indoors to escape the heat. Whip up a big batch of this pasta salad and serve it at your next scorching hot party! Your guests will surely thank you for prepping something cold rather than hot! You’ll want to follow the cooking instructions on the bag of Israeli couscous. 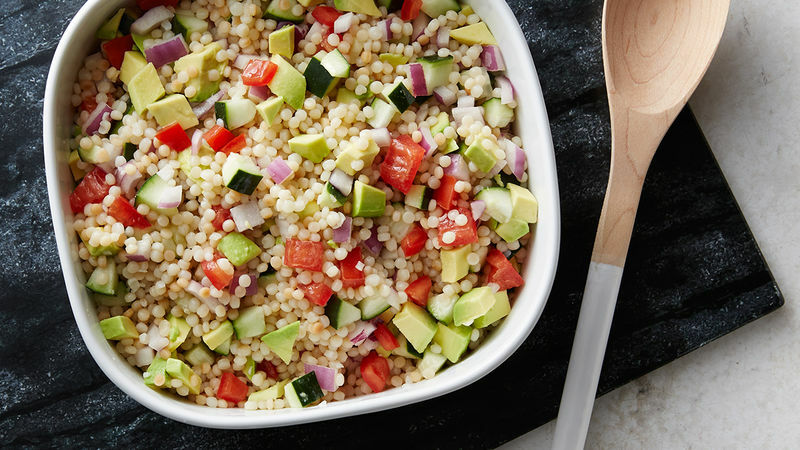 While your couscous is cooking, chop up all your veggies. Once your couscous is done cooking let it cool for 15 minutes, then put it in a large bowl and throw all your veggies in with it. Add the juice from 2 lemons. Then drizzle in the olive oil. Give it a good, gentle mix with a spatula. Then pop it in the fridge for a couple hours to chill and get ready to cool down once it’s done!